This review was originally posted to Alegis Downport in May 2018, and appeared in the July/August 2018 issue of Freelance Traveller. Manhunters: Bounty Hunters in Clement Sector. John Watts. 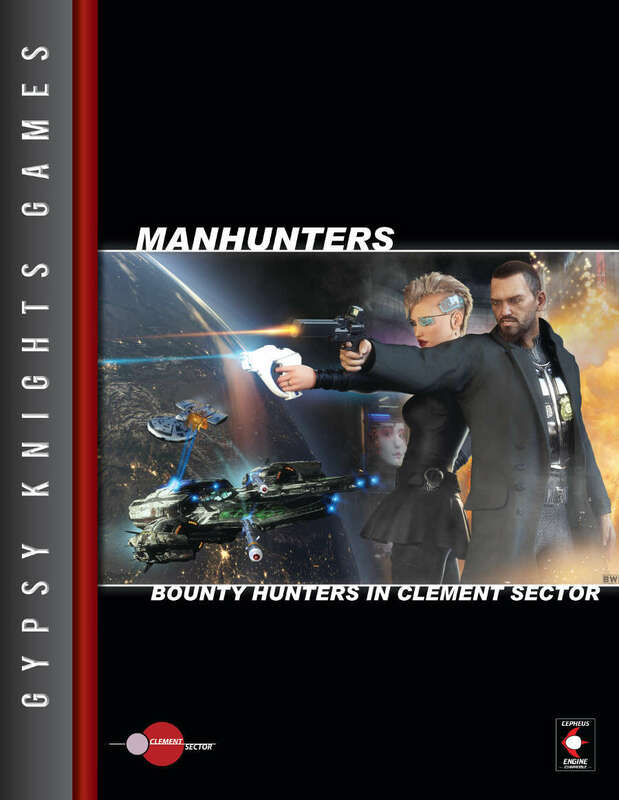 Manhunter: Bounty Hunters in Clement Sector is one of the new releases from Gypsy Knights Games. The material is compatible with the Clement Sector rules set or Cepheus Engine rules and could be adapted for other 2D6 SF RPG rule sets. The bounty hunter is one of the more popular types of character that many gamers like to play; sometimes mysterious, usually tough and grizzled and always relentless; it’s easy to see why they are well liked as either player characters or NPCs. It would be remiss not to mention some of the more famous hunters from fiction such as Boba Fett from Star Wars and Deckard in Blade Runner. Io9 has an article on ten of the coolest in science-fiction. There are also those from (real) history such as Thomas Tate Tobin who tracked his three targets and brought back their severed heads after refusing the help from a 15-strong militia. So how does GKG expand on the ‘standard’ bounty hunter character from the rules book? The author, John Watts, delves in with a couple of pages of narrative ‘Another Day on Chance’ which describes the setting up of a deal between a bounty hunter and client. After a illustration depicting the deal by Bradley Warnes, you are introduced to what makes a manhunter in the Clement Sector. The next five pages break the eight types of manhunter down to the particular specialisms they are known for. (Traditional) bounty hunters are usually independents who wait for a monetary bounty to be posted by, e.g., a government or corporation) for the capture or death of a criminal. Altrant/Uplift hunters are repossession agents working for someone or organisation that consider altrants or uplifts as property. Marshals are specialised law enforcement agents tasked with the arrest and recovery of fugitives. The marshals’ remit may encompass many of the other types of ‘bounty hunting’ but only within the scope of what is legal. Because the many worlds in the Clement Sector have different laws and views on what is or isn’t allowed, the next twenty-six pages describe in great detail the various worlds of the Hub, Cascadia, Franklin, Sequoyah and Colonies subsectors. This could get heavy going as there is a lot of text to go through (which is broken up with very fine images by Bradley Warnes) but John Watts has made the reading easy-going and engaging. Don’t expect to be able to leave one world where anything goes and stride into the bar of another world pointing your gun at your quarry and expect to get away with it. There are many nuances; it’s not just laws and governments, but many corporations have the say in a geographic area and their views take precedence. For example, the Blaylock Mining Corporation believes that if they hire anyone, their employee is free of any legal problems that they have incurred on other worlds and they will not allow anyone to bring harm to one of their employees. What is considered as slavery on world, would be perfectly acceptable for a hunter to try and bring back an altrant on the run – dead or alive.